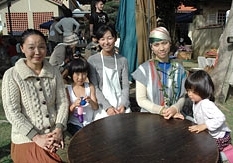 Members of Tida no wa, singer-songwriter UA (second from right), Kiko Nemoto (center) and Yuko Sawano (far left) at the Futenmanzan Jinguji Temple in Ginowan on January 8. Concerned about the potential impact of radioactive fallout on her children, last April UA moved to the northern part of Okinawa’s main island. Her mother is from the Amami Islands so she has an affinity with Okinawa and its distinctive energy. She came up with the idea of holding a festival when thinking about what she might be able to do to help protect Okinawa. Tida no wa was established on November 11, 2011 as an organization to host festivals and to create a network of parents who would look into food-safety issues. On January 8, the organization promoted the Tida no wa Festival in Tsunagu Omoi, or Connected Memories, an event held at Futenmanzan Jinguji Temple to support earthquake refugees. Profits from the event were donated to Tida no wa. The objective of the organization is to expand exchange to encompass not only to the people who have taken refuge from other prefectures, but also local people. UA said, “I would like to tell our beloved neighbors about the things I’ve learned.” She is always striving to get as many people as possible on the same wavelength. The Tida no wa Festival includes live performances by UA and husband and wife duo　Aimoko, and a lecture by Katsuma Yazaki, professor emeritus at University of the Ryukyus on internal exposure to radiation. For further details, access the blog of Tida no wa at http://tidanowa.ti-da.net/ or call Ueda of Tida no wa Festival Executive Office at 050 (1576) 1117.